Love these Artisan Soap Sale $3.85 (Retail $6.50). Our collection of artisan made, cold process soaps are the best out there! Made right here on the East Coast in the USA! Each soap bar is made with fresh, high quality ingredients you can trust. -Green Apple &amp; Rose: tart green apple with rose petals. -Sage &amp; Berries: herbal sage and sweet berries to balance. -Cotton Blossom: Smells like sun dried laundry- soft floral with clean cotton fragrance. -Mean Green: strong and clean scent. Sage and other mild greens. With sea salt, peppermint leaves, and ground oatmeal as exfoliants. -Fruity Tooty: You'll be dancing in the shower with this fruity soap! It's a fruit party! -Lavender &amp; Patchouli: sweet florals and lavender buds. 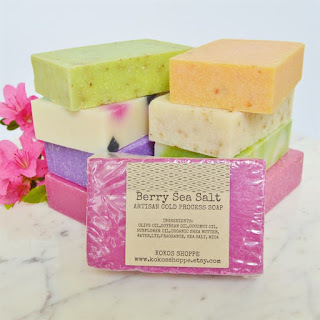 -Berry Sea Salt: sweet berries and sea salt for exfoliate. -Summer Mango: Mango &amp; Orange with sea salt and oatmeal as exfoliants. -Lavender &amp; Oak Moss: A beautiful blend of soft lavender with earthy and spicy oak moss. -Salty Sandalwood: Musk, Sandalwood &amp; Rose with sea salt for exfoliate. -Basil &amp; Spearmint: Invigorating and fresh! You'll want to close your eyes and take in the fresh basil and minty awesomeness. -Pacific Breeze: Soft fruity notes with sea salt for exfoliate. -White Tea &amp; Sweet Mint: Balanced, light and so fresh! Size: Bars are approx 3.5 x 2.25 x 1. Each weighs approx 4.8 ounces. $2.99 for the first item and $0.99 for each additional item. US only. Ships no later than Fri, May 25.